​Have your tried to search for a solution on Oracle Support but you get similar search results even if you change your search term? Not sure if it happened with you but it has sure happened a lot with us. Looks like Oracle has few top results (may be popular) that are ranked higher than other posts which are always shown and hence makes the search not so useful some times. We know that Oracle support has a huge database of issues/solutions/fixes but not a very efficient way to find it. So how to search for solutions on Oracle support in an efficient way? Yes, you can use Google to search for Oracle Support solutions and given that there are multiple filters you can use on Google, you can get to your desired solution quicker. Go to Google.com and type your search term and add site:support.oracle.com as shown below. It will show you the search results from Oracle Support only. When you click on the search result, you will be required to login with your Oracle support id to view the solution. You can further filter the search results by clicking on “Settings > Advanced Search” and filtering by date range. For example, if you want to search for any solutions posted in last 24 hours or last week or last month you can select that option. In above search result, we filtered to show posts from past month and search results only show latest posts. We found it to be really helpful when you are searching for latest posts/fixes. Though search on Oracle support also has a similar filter but we found Google to be little better (and we all love Google anyways). 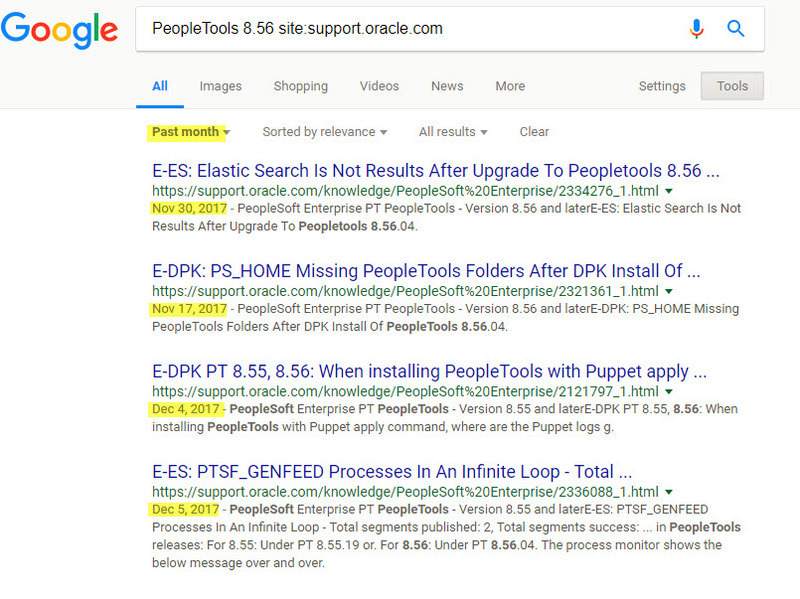 Latest search results shown in Google search also depends on how frequent Google indexes Oracle Support posts so at times you might find a solution on Oracle Support which isn’t shown in Google search results. If you happen to know any cool trick do reply and we will share it with PeopleSoft community.